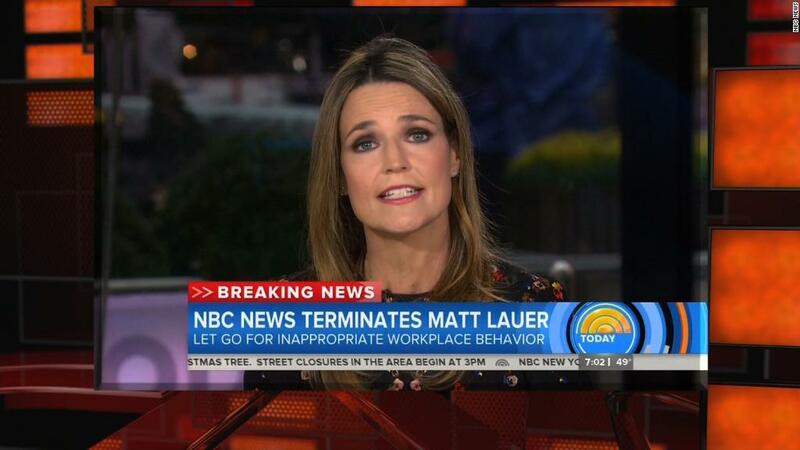 Today Show co-anchor Savannah Guthrie delivered breaking news Wednesday morning that her colleague Matt Lauer had been fired for reports of sexual misconduct. "Breaking news overnight. 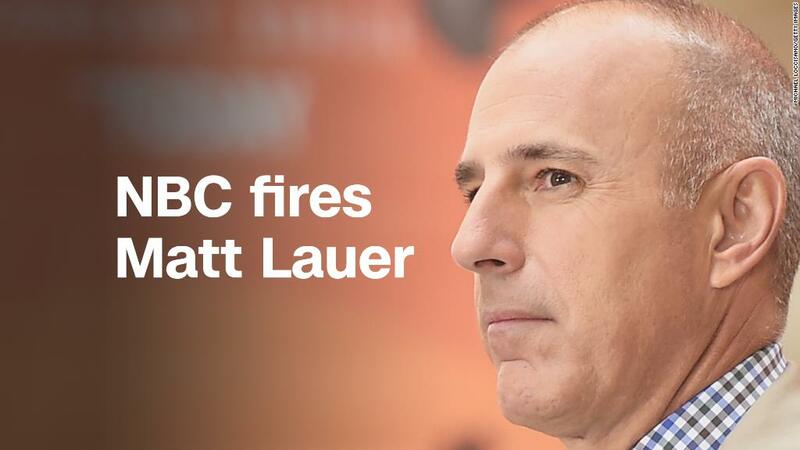 Matt Lauer has been terminated from NBC News," Guthrie said at the top of the show. "Our chairman has released a statement saying a colleague has come forward reporting behavior in violation of company standards." Guthrie was joined by co-host Hoda Kotb to deliver the news on what she called a "sad morning here at Today." "We just learned this moments ago, just this morning" Guthrie said. "As I'm sure you can imagine, we are devastated. We are still processing all of this. And I will tell you right now we do not know more than what I just shared with you. But we will be covering this story as reporters, as journalists. I'm sure we will be learning more details in the hours and days to come. And we promise we will share that with you." Guthrie then gave her personal take on the news. Related: NBC fires Matt Lauer after complaint about "inappropriate sexual behavior"
"For the moment, all we can say is that we are heartbroken. I'm heartbroken for Matt. He is my dear, dear friend and my partner and he is loved by many, many people here. And I'm heartbroken for the brave colleague who came forward to tell her story, and any other women who have their own stories to tell. And we are grappling with a dilemma that so many people have faced these past few weeks. How do you reconcile your love for someone with the revelation that they have behaved badly. And I don't know the answer to that. But I do know that this reckoning that so many organizations have been going through is important. It's long overdue. And it must result in workplaces where all women, all people, feel safe and respected. As painful as it is this moment on our culture, this change had to happen. " Kotb said she too is working to process the emotions that come with the news of her colleague's alleged misconduct. "This is a very tough morning for both of us. I've known Matt for 15 years. I've loved him as a friend and a colleague. And again, just like you were saying Savannah, it's hard to reconcile what we are hearing with the man we know who walks in this building every single day. We were both woken up with the news kind of predawn. And we're trying to process it and make sense of it. And it will take some time for that," Kotb said. Guthrie said the Today Show anchors will work through the story as it develops. "We are processing this with all of you at home. And we promise to be transparent and be straightforward and continue this important conversation," Guthrie said. "This show has been on the air for 65 years. And we're here because of you. We're supposed to bring you the news, so we're going to do that. We're going to keep doing it and doing it together, all of us, and the crew and the people who love this show. And so we will go on with the news," Guthrie concluded. "Yes we will," Kotb said.